Super Crazy is a world-renowned talent who is best known to be employed by World Wrestling Entertainment. Before being signed to WWE in 2005, he was briefly in the WWE as Super Loco and appeared frequently on the short-lived WWE Super-Astros program, where he rarely appeared on Raw and wrestled on Shotgun mostly, and was able to participate in the WWF Light Heavyweight Championship tournament. Super Crazy was mostly on the SmackDown! brand and developed a feud with former partner Psicosis, but was taken off the road in July 2006 for elevated enzymes in his liver. He returned to the WWE in late 2006 where he was on the RAW brand. Two years later he was drafted to ECW, but he decided to go back to Smackdown instead. He asked for a released in the WWE on November 5, 2008, because he was unhappy with the role he was playing in the company. He return to Mexico the same year, but refused to sign with CMLL and AAA (in fact, AAA booked him for a show, but Crazy was unavailable). 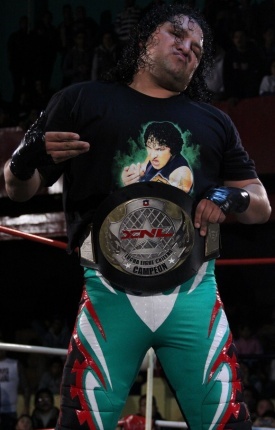 Instead, he's wrestling with Perros del Mal promotion, X-LAW and his own company in Tulancingo, Hidalgo. Outside of Mexico, Super Crazy has also competed in IWA Puerto-Rico, XPW (most notably against Psicosis), New Japan Pro Wrestling, All Japan Pro Wrestling, Pro Wrestling ZERO1, Battlarts, Dragon Gate, AEW (Spain), Ring of Honor and TNA. 1988/03? mask El Seminarista Super Crazy Arena Neza - Nezahualcoyotl, Mexico State? (1) VS. Scorpio Jr. & Zumbido VS. Damian 666 & Mr. Aguila; (2) six man cage match vs Psycho Clown & Monster Clown, w/Damian 666 & Perro Aguayo Jr. This page was last edited on 19 August 2016, at 08:03.